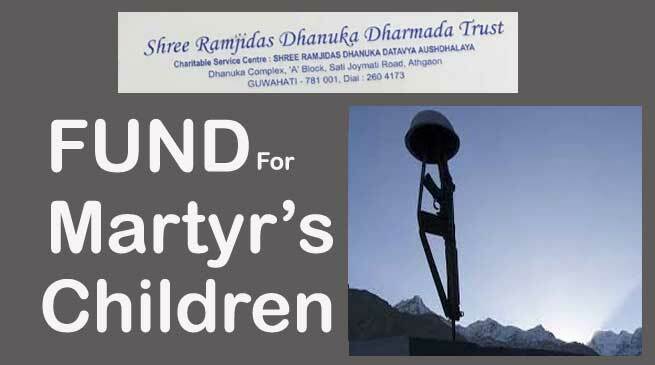 Guwahati based Ramjidas Ganpatrai Dhanuka Charitable Trust, has decided to dedicate a fund to provide help and support for education of children of Martyr’s of Armed Forces and Paramilitary Forces during declared and undeclared war against India. This was informed by the trust Chairman Mr Ashok Dhanuka. Mr Dhanuka informed that the trust in its noble initiative has decided to bear the burden of school education of Martyr’s children. The trust has worked out a mechanism to disburse the school fees of such children in their respective school accounts. The fund will be disbursed according to payment schedule of the respective schools in which children are imparting education. The trust has also released a mobile number –09864145000 on which martyr’s family can approach for the education of their children.